It is important for us to recognize that this fear was not in the sense of reverence for God, or standing in awe of Him, both of which are implied in a healthy fear of God. As long as Adam and Eve were in perfect relationship with their Creator, they knew only this kind of fear, and they exalted Him and recognized His power and position from their blessed state. But once they rebelled and lost that holy relationship, they were separated from Him spiritually, and to be in His Presence generated a deep-seated dread and terror of the Lord. 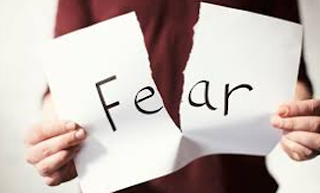 Here, the sense of the word fear takes on a completely different significance. 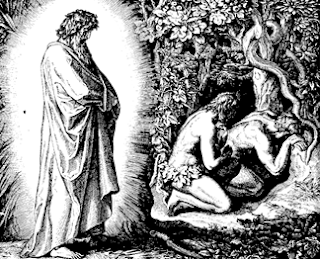 And who was there in the garden to exploit that dramatic change in the relationship between man and God? The Father of lies! He witnessed how terror and dread was a by-product of being out of right relationship with God, and it became a most useful tool in keeping man separated from His Creator and from restoring that full relationship. And today's Christians, who are spiritually saved, are easy targets for the Enemy and his spirit of Fear. Along with the spirit of Anger, it is probably the most common attack that Mark and I witness in our ministry. God is in control of everything. If they or a loved one are ill, or suffer from depression or anxiety, or any number of attacks from the devil, then God is allowing it. Their suffering is a way to bring them into submission to God's will for their life. Therefore, why would they go against God? After all, isn't that what the Book of Job is all about? But the Bible says that God's will is good, perfect, and acceptable. Did you get that? That is the description of His will -- whether you are giving thanks; doing good; abstaining from sexual immorality; acknowledging that His kingdom has come; doing what is pleasing in His sight; doing justice, loving kindness, and walking humbly with Him; confessing your sins; etc. -- it is all His will [the desire of His heart] and His will is good, and perfect, and acceptable to Him. It is NEVER His will to see His children suffer, just as no good father on earth would desire his child to suffer. Did you ever read in your Bible where Jesus told anyone, "I wish I could heal you, but my Father is telling me that you have to suffer a little in order to improve your relationship with Him"? No! The Bible repeatedly tells us that Jesus healed all who came to Him, or healed all who were ill (Matthew 15:30, 12:15). But the fear of God allowing the devil to torment us to test our faith is a wrong interpretation of Job, while being a very real apprehension for a lot of Christians. We must always be careful of being deceived. Fear of deception by the devil is probably the most voiced argument I hear for not walking in our power and authority. Peoples' fears are often expressed like this ... If we go outside of our denomination's doctrine, how do we know our interpretation of Scripture is correct? If hearing something different than the theology I've established for myself makes me uncomfortable, then it can't be from God -- it must be a deception by the Enemy... I don't really trust anything I hear that's not backed up and supported by my Church, my pastor, my Christian friends, the Biblical interpretation I've been taught, or fill in the blank. But all I'm hearing in these arguments is the reliance on human wisdom. Where is the trust in God and the Holy Spirit to reveal their Truth to you? This sounds an awful lot like the religious skeptics in Jesus' day. After all, Jesus invaded comfort zones and challenged religious traditions and ideas 2,000 years ago -- and He hasn't changed! At some point, we must quit being afraid of being deceived and trust that God can still speak to us! We must see a God that is bigger than our concept of a deceiving devil. If we are afraid of letting the power of the Holy Spirit work through us [as He did Jesus] to battle sickness, demons, or to bring people to a decision for salvation, then we give the devil more power than he deserves OR has. I'm afraid I'll do it wrong. This would be a valid argument if you were doing it under your own power. But you're not! Take a look at Mark 16:20... It reads, And they [the Disciples] went out and preached everywhere, while the Lord worked with them and confirmed the message by accompanying signs. The Disciples were doing what Jesus commanded them [and us] to do... preaching the Gospel of the Kingdom, accompanied by the signs and wonders of healing the sick, casting out demons, etc. But look at the previous verse in Mark 16:19. So then the Lord Jesus, after He had spoken to them, was taken up into heaven and sat down at the right hand of God. Did you see what the Bible said happened? It was AFTER He ascended that Jesus worked with them and confirmed the message by accompanying signs. I'll say it again ... This was after His resurrection! Yet He worked with them (partnered with them) to do the miracles of healing and deliverance after He had risen to heaven! He continued to work with them perfecting their abilities through His power. He is the same today as He was yesterday! He has sent the Holy Spirit to do the same with us. You can't do it wrong, because it's not you doing it -- it's Him! All He needs is willing partners, and your trust and faith in Him. But too many Christians let fear, doubt, and unbelief creep into their minds and hearts, therefore making it impossible for Jesus and the Holy Spirit to work through them. Jesus makes it pretty clear that we have nothing to fear! We have been given all His authority, and He makes sure we understand that absolutely nothing can harm us. And notice what else He says: that while we are carrying out our Lord's commands to continue His work [which is our ministry], it causes Satan to topple from his place in heaven. Remember: the Bible makes it clear that there are multiple heavens, and at some point, I plan on writing a post on where Satan rules his kingdom from. But for the sake of this article, I don't want to get caught up in all the theological theories on when this happens, but want to concentrate on the fact that Jesus tells us that 1) we have all of His authority, 2) we have nothing to be afraid of, and 3) when we walk in our designated power and authority it causes Satan to "topple" or "fall", as it is stated in the King James version. It is very possible that Jesus is telling us that our willingness to heal and deliver causes Satan to fall into ruin, or fail, and it happens as suddenly as lightning hitting the ground, every time we walk in that authority. And the last argument from those fighting fear is this one: I believe that you have to be specially anointed in specific spiritual gifts to do this work, and I don't have the gift of healing. It is my discernment that this argument comes from a lack of understanding of the Holy Spirit. If we are saved by grace for our faith in Jesus, then the Holy Spirit resides in us. And the Holy Spirit has produced all the gifts and has them with Him, with the ability to give any [or all] to us as we need them. So that gift of healing is already present in you with the presence of the Holy Spirit. You just have to decide to be obedient to Jesus' commands and cooperate with Him and the Spirit to see someone healed. If you will take a look at 1 John 2:27, I think you will find an answer to the fear of walking in the gifts. In reference to being deceived by false teachers or doctrines [or even the devil], John instructs believers: But the wonderful anointing you have received from God is so much greater than their deception and now lives in you. There’s no need for anyone to keep teaching you. His anointing teaches you all that you need to know, for it will lead you into truth, not a counterfeit. So just as the anointing has taught you, remain in Him. “anointing” is the Holy Spirit poured into us, bringing life, illumination, wisdom, fruit, and power from the indwelling life of Christ. He covers it all -- everything we need to defeat the works of the devil, just as He did. In summary, I don't want to downplay the power that fear has in the lives of Christians. 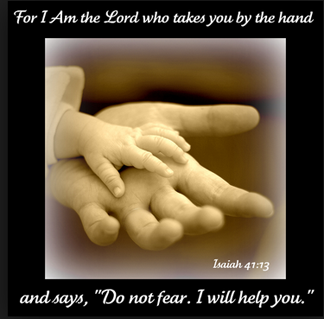 I personally know the all-consuming fear that can separate one from our Father in Heaven. And it is the fiery dart that the Enemy loves to use against me more than any other. But I continue to choose the Truth of the Word and the promises that Jesus has given us: we have authority over all the power of the Enemy and nothing can harm us. So, while not easy, to live freely, without fear, is a choice; a choice to believe -- and when necessary, to repent for giving in to the snare of the devil, and to once again take that step of faith to walk in my true identity as an empowered child of God and co-heir of the Kingdom with Christ. I declare that the spirit of Fear is the real deception of the devil, and I walk in the perfect love of the One who died for me. Psalm 56:4 What harm could a man bring to me? With God on my side I will not be afraid of what comes. The roaring praises of God fill my heart, and I will always triumph as I trust His promises.